The Angriest: Yowamushi Pedal: "Full Power vs Full Power"
It is 2 December 2013, and time for episode 9 of Yowamushi Pedal. Onoda and Imaizumi race the final 500 metres to reach the peak and claim the "King of the Mountain" title. Naruko has tipped the balance in Onoda's favour, however, having taught him a new racing trick before he caught up with Imaizumi. 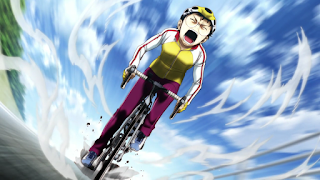 With his energy then spent, however, Onoda may not be able to finish the race. This episode takes 10 minutes for Onoda and Imaizumi to ride 500 metres. I commented a few episodes back that the racing scenes feel as if they are occurring in real time. Now they're occurring at considerably less than real time. Time is now slowing in Yowamushi Pedal to such a degree that it is effectively being presented in slow motion. There is a strong push here for emotion over realism, of course: this first section jumps from Onoda to Imaizaumi to the seniors in the van, each of them getting more and more emotional as the race to the peak narrows. It is the sort of thing you get at the climax of a feature film, as the entire 'will he/won't he' suspense gets drawn out to a ridiculous extreme. This of course causes this episode some problems because Onoda just pips Imaizumi to the peak at the episode's halfway mark. Everything afterwards feels anti-climactic. The second half of the race - down the mountain and around the dam - is hand-waved away, with the focus sticking on an exhausted Onoda who has collapsed with exhaustion. It's a weirdly sedate epilogue to the race, particularly after the over-the-top melodrama that preceded it. It is nice to see this part of the episode at least suggest a sense of reality - there's no way Onoda should or could have won the overall race with such little training - but still keep up the generally upbeat nature of the show. The race is finally complete, after five episodes following it, and that is something of a relief. It Yowamushi Pedal is going to work in the long term, it will need to find ways to make these drawn-out races more varied and interesting: simply following Onoda along for more than 100 minutes of emotional cycling is not going to cut it. This is episode felt a little better than the last few, mainly because things did actually get resolved, but for now the series feels like it is on shaky ground. Nine episodes in, there have been six good episodes: the quality ratio sits at 67 per cent.